But in all honesty, not very well. Since we took our trip smack dab in the middle December and returned home, oh...let's see, 7 days before Christmas, it's been a bit of a holiday scramble around here. Would you like a side of toast? Friday evening we went to get our tree. The tree lot was getting bare and the tree guys seemed bored. We found a small Frasier Fir we liked so it came home with us. Once Scott got the lights on, A. and I decorated it. There were moments we debated getting a tree this late in the season, but now I am so glad we did. I may just display my eccentric side and leave it up through most of January. For A. 's little class party, I was responsible for the craft. I was not in the mood for glue, so they made beaded pipe cleaner candy cane ornaments. They seemed to like it, A. liked it so much she proceeded to make about six more later that afternoon at home. You may notice a conglomeration of beaded circle ornaments, that's all her. Cute, no? While we decorated, I forced my family to listen to my latest addiction. Have you heard the Hotel Cafe collection of winter songs? Oh my goodness, it's refreshing and haunting at the same time. Once the tree was decorated, it was on to holiday baking. At least my version of it. Some sweet (pardon the pun) friends gave us some Puppy Chow mix which triggered my Oh I Must Make Some of This Right Stinkin' Now response, so A. and I did. Now I am somewhat sick of it. Just somewhat though. Please don't laugh at my version of sugar cookies. In my feeble defense, I plan to add food coloring and bust out my cookie press, there may even be icing and sprinkles. Did you know Pillsbury also makes a gingerbread dough? I just found out and Oh I Must Make Some of That Right Stinkin' Soon. The trip to our mailbox has been delightful each day this holiday season . 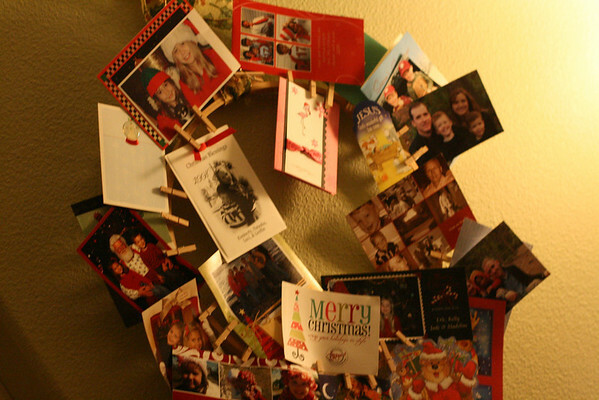 I love, love, love finding Christmas cards and photos inside from family and friends waiting to be gleefully opened. Thank you friends, I appreciate each and every one. I have come to the sad realization that our cards will most likely become Valentines. In a perfect world I would have planned The Family Photo earlier in the year, made my cards from scratch and mailed them the day before Thanksgiving. Anyway, my card wreath makes me happy. Now, just one more holiday tidbit, don't forget to track Santa as he makes his progress around the world Christmas Eve. It's loads of fun. We did this last year and A. got such a kick out of it, okay...I'll admit it, Scott and I did too. 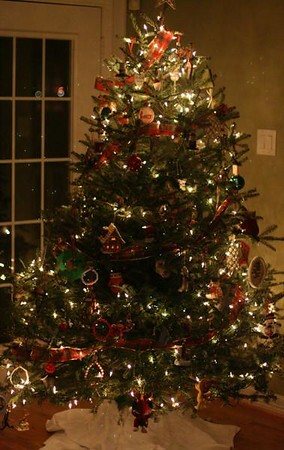 Your tree is so pretty - aren't you glad you got one? 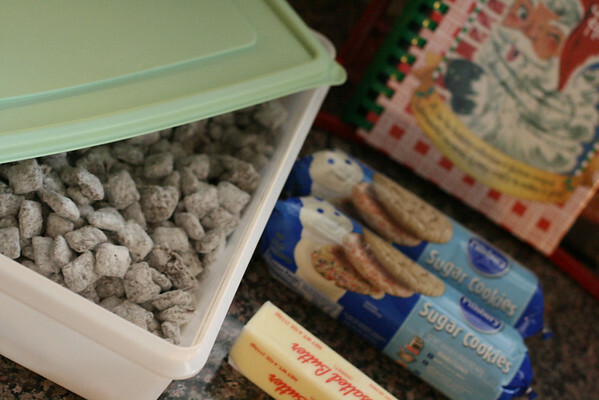 i LOVE puppy chow/muddy buddies! :) YUM! i about need to make me some of that myself- but considering there's just one of me and one toddler...that may become a holiday disaster of food. ah! i see my hooded baby in your holiday card mix! jack just asked if we could skip tracking Santa next year...it was too stressful for him!! bwahahaha. at least, i'm assuming, that means we have another year of Believing. and i am o.kay. with that. Where did you get your card wreath? I love it and definitely need one for next year. The cards-taped-to-the-fridge thing isn't working for me.